With the first whiff of Spring this year, I was already beginning to crave cool summer drinks and treats. 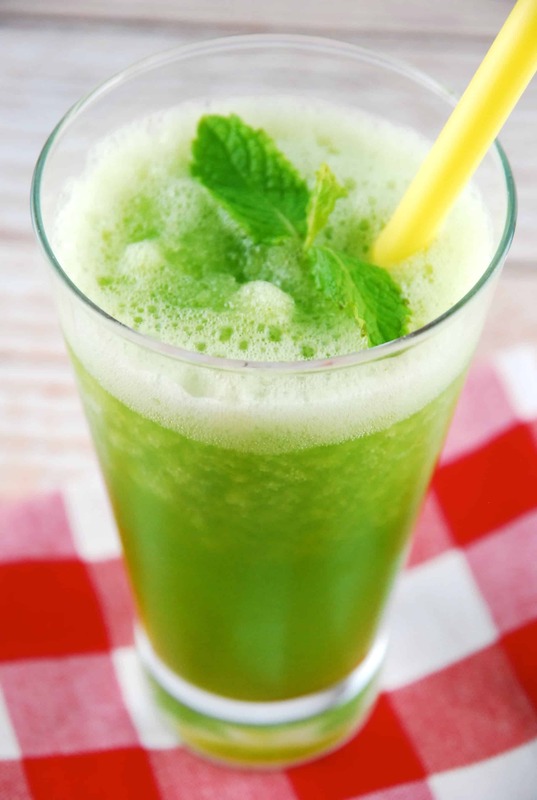 One of my favorites is this Mint Lemonade Slushy recipe. I first had one of these drinks on a trip to Israel, where it’s referred to as “limonana”. Under the hot desert sun, I don’t think I’ve ever had a more refreshingly delicious drink! The original recipe uses sugar as a sweetener, but to cut out those calories and Points, I just replaced the sugar with organic stevia. Honestly, I’m not a fan of artificial sweeteners of any kind, and I try to avoid them when I can. But there are sometimes where I just HAVE to have one of these Mint Lemonade Slushies, and I don’t want to blow a ton of my precious Points to have one. So I use the Stevia, and this recipe ends up costing me 0 Points. Yay! When I make it for my kids, I sweeten it with honey instead of the Stevia, and they LOVE it. It’s not hard to see why….it is SO FLIPPING’ GOOD. It’s true they’re perfect poolside drink. And if you want to add some extra excitement and turn this into an adult beverage, feel free to blend it with some vodka or gin…just be sure to factor in those points. Enjoy! Cool, refreshing, sweet, and tangy, this delightful slushy is sure to be your new favorite summer beverage! Pulse all ingredients in blender until slushy-like texture is reached. Serve immediately.